Direct traffic is most often the result of a user entering a URL into their browser or using a bookmark to directly access the site. Essentially, Direct sessions occur any time Google Analytics cannot determine another referring source or channel. This differentiates Direct traffic from other default channel groupings like Organic, Referrals, Social, Email and Paid. However, Direct traffic may also consist of users who reached the site in other ways. Clicking a link from a Mobile social media apps like Facebook or Twitter Mobile apps may not pass referrer information . A User going to a non-secure (http) site from a link on a secure (https) site, as the secure site won’t pass a referrer to the non-secure site. For instance, if someone clicks a link on https://example.com to go to http://example2.com, the analytics for example2.com will show the session as direct. In some situations, accessing a site from organic search may end up being reported as Direct due to browser issues. An experiment conducted by Groupon showed as much as 60% of direct traffic may be from organic search. As you can see, Direct traffic can encompass a wide range of sources, including those you would have liked to have tracked in analytics. Fortunately, while you can’t salvage the sources for 100% of the traffic lumped into the Direct category, you can take measures to ensure you accurately track as much traffic as possible. One way to address proper allocation of Direct traffic is to add tracking parameters or to tag URLs used in specific campaigns. 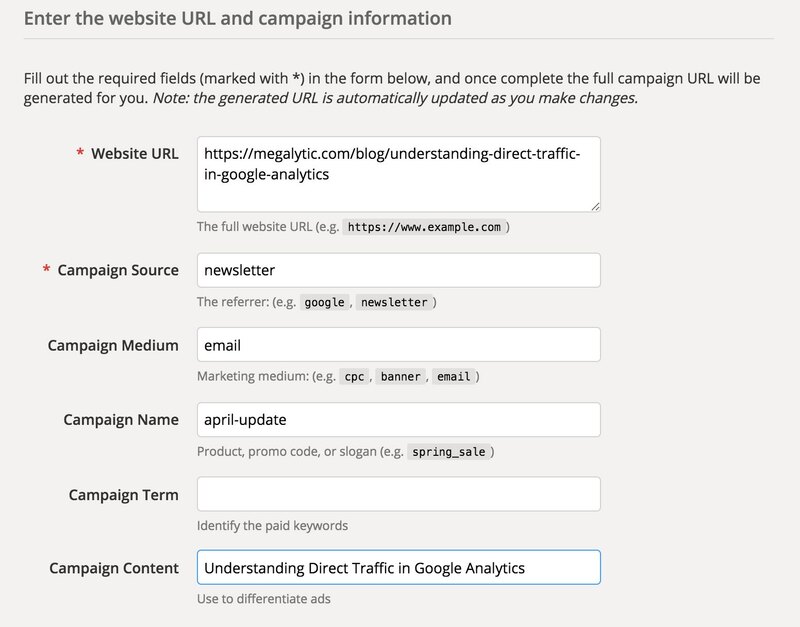 For example, you can prevent traffic from your April email campaign from being miscategorized as Direct by adding parameters that ensure all Sessions from this campaign shows up as “Email” in GA.
Google’s Campaign URL Builder tool makes the process of tagging URLs simple. To get started, enter your URL in the first field, then fill in the rest with terms that relate to your particular campaign. In this instance the Source is “newsletter,” Medium is “email” and Campaign Name is “april-update” to delineate the specific email. Sessions from this email will now show up as newsletter/email in the Source/Medium report (Acquisition > All Traffic > Source/Medium) in Google Analytics. In addition to helping prevent this traffic as being lumped as Direct, you’ll also be able to more accurately measure performance from your newsletter campaigns by seeing data in one place. Note that some email marketing platforms, such as MailChimp and Constant Contact, offer the option to automatically tag URLs with parameters. You can take advantage of this feature to avoid having to manually tag every URL. However, be aware that if you want to maintain consistency in tagging standards, you’re better off manually tagging URLs. For more details, see our post on Consistent Tagging for Better Campaign Tracking. The URL builder will also help you solve issues with shortened URLs being categorized as Direct. See our article on the Dangers of Shortened URLs for more information on this topic. Also, if you are placing a link on a secure (https) site and linking to your site on a non-secure (http) domain, you’ll want to add tracking parameters to be sure the referrer carries over. For an example of the problems that can result from https to http traffic, see the dramatic drop in the graph below. In this recent instance, a company offering software development training courses suddenly saw referrals drop from Scrum Alliance, a particular site where listings had previously generated significant revenue. The listings were still being posted to Scrum Alliance regularly, so there seemed to be no reason for a sudden decrease in referrals. Upon further investigation, it was discovered that this decrease in referrals correlated with an increase in Direct traffic, so they suspected something was amiss with Google Analytics’ tracking of the referrals from this site. Upon further digging, they noticed the date when GA stopped tracking referrals from Scrum Alliance correlated with an upgrade in which the entire site switched to https, while the destination site remained http. All referrals were now being counted as Direct. To solve this problem, the links from Scrum Alliance were updated to include tracking parameters, with a long-term recommendation of switching the whole destination site to https. Learning from this example, realize that a drop in traffic from a particular source does not necessarily mean a drop in traffic. It could indicate a case in which that source ended up being categorized under Direct traffic. Look for red flags, such as sudden increases in Direct traffic correlating with sudden decreases of other sources. In addition, proactively use tracking parameters in cases where you may be risking not properly seeing traffic. Especially since you can’t retroactively correct data in GA, you want to ensure that you have the most accurate data possible to present to your clients. Be transparent about the fact that data from any number of sources could end up in the Direct bucket. Explain all the different scenarios that could result in Direct, such as email, search or links from https sites. While in some ways frustrating, this knowledge can play to your advantage in an SEO campaign, showing your client that they likely have received more organic search traffic than Google Analytics shows. When problems occur that result in miscategorized traffic, such as untagged email links, explain to your client the need to properly tag links in order to track traffic correctly. Being proactive about addressing past issues will show your client you care about presenting the most accurate data possible. Direct traffic can be the bane of many analytics professionals’ existence. However, taking the right steps to address potentially miscategorized traffic, as well as being upfront with clients about the causes, can help to mitigate problems. Take the time to understand Direct traffic, as well as situations relating to your website in which you can ensure you have the most accurate tracking possible.